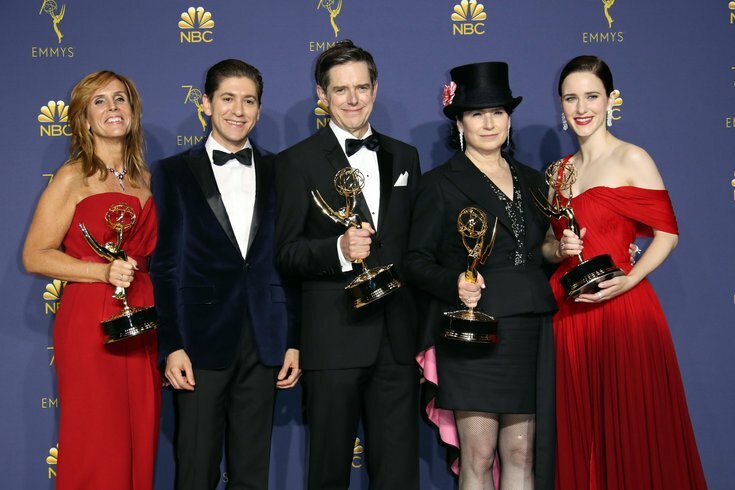 Rachel Brosnahan, right, and crew of "The Marvelous Mrs. Maisel" poses with their awards for Comedy Series in the photo room during the 70th Emmy Awards at the Microsoft Theater. Monday night marked the 70th anniversary of the Emmy Awards, with Michael Che and Colin Jost of "Saturday Night Live" hosting the first ceremony since the #MeToo movement broke in Hollywood. Despite the heightened political undertones prevalent during much of 2018's other award shows, particularly during January's Golden Globes, this year's Emmys was markedly less political. Check out the highs (and lows) of the show, plus some Twitter reactions, below. Critics are already in general agreement that the #MeToo movement was markedly absent from the ceremony – the only real reference made to it came with Che's joke that he was sharing the stage with the talented people of Hollywood "who haven't been caught yet." Surprisingly, nobody on stage mentioned Les Moonves, the powerful CEO at CBS who was recently ousted amid multiple allegations of sexual harassment. One of the show's highlights came right at the top, though, when Kate McKinnon and Kenan Thompson kicked off a tongue-in-cheek number about Hollywood's complex diversity problems being magically solved. Che and Jost followed the song with their opening monologue, poking fun at broadcast television and the downfall of Roseanne Barr. Regardless of content, reactions to Che and Jost's roles as co-hosts was mixed at best. This is like the parody of an Emmy opening monologue that people on a good comedy would watch. #emmyawards. "Gilmore Girls" fans were elated when they saw showrunner Amy Sherman-Palladino, now the force behind Amazon's "The Marvelous Mrs. Maisel," win two Emmys back-to-back for best writing and direction in a comedy. Sherman-Palladino is the first woman to ever win both awards in the same year. The comedy also won big for acting – both stars, Rachel Brosnahan and Alex Borstein, went home with awards. Later the series was crowned best comedy. Amy Sherman Palladino just won an Emmy. Stars Hollow is going to be lit tonight. On the drama side, "Game of Thrones" dominated another year, with Peter Dinklage winning for the supporting actor category, for the third time, and the show itself winning best drama series, also for the third time. Despite the opening number's emphasis on diversity, the ceremony came with big snubs to most nominees representing people of color. Sandra Oh, favored to win for best leading actress in a drama ("Killing Eve"), was defeated by Claire Foy for her role as Queen Elizabeth II in "The Crown." "Atlanta," which was nominated more than any other comedy with 16 nominations, was completely snubbed. However, many recognize the show still won the Internet, with Donald Glover's creepy character Teddy Perkins randomly appearing in the audience. In the end, only three actors of color were awarded for their work: Regina King, for lead actress in a limited series ("Seven"), Thandie Newton, for outstanding actress in a drama series ("Westworld"), and Darren Criss, for best actor in a limited series ("American Crime Story"). "This is the most diverse #Emmys ever!" Feminist dystopian drama "The Handmaid's Tale" was also completely locked out of wins for the night. The Australian comic gaining traction for her Netflix special "Nanette" charmed audiences during her one-minute monologue, with many on Twitter asking that she return to host next year. This is a first. Glen Weiss, hot off his win for best outstanding directing for a variety show, dropped to one knee and proposed to his girlfriend while accepting the award. Harry Winkler won his first Emmy award at the age of 72 for his role in "Barry." Check out the full list of winners and nominees from this year's Emmy's here.